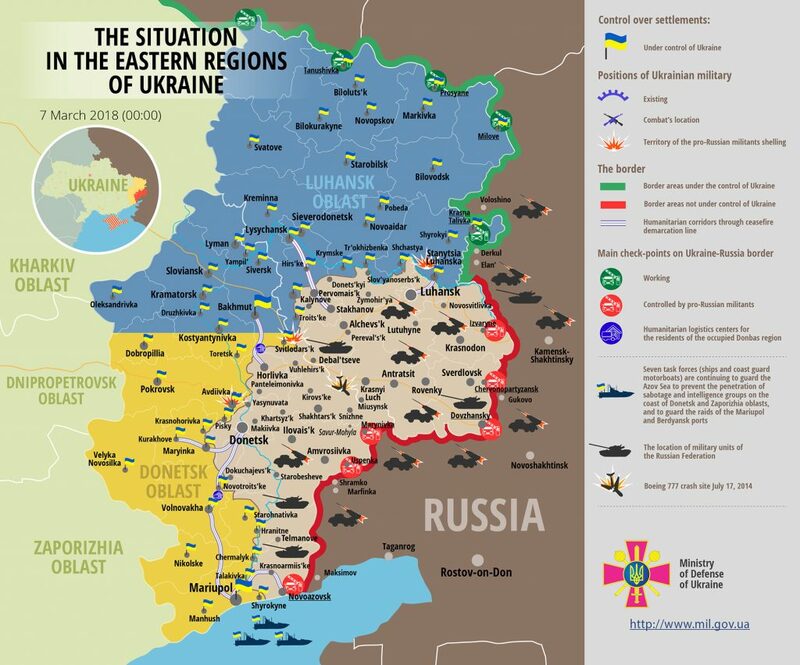 Over the last day, Russia-backed militants made three precision attacks on Ukrainian troops’ positions. According to the updated information by the Ukrainian side at the Joint Center for Control and Coordination, on March 5 militants shelled the residential areas of Shchastia. No civilian casualties were recorded. “They attacked the civilian houses with 82-mm mortars and small arms,” reported Ukrainian Ministry of Defense spokesman on ATO Dmytro Hutsulyak at a press briefing at Ukraine Crisis Media Center. In Luhansk sector, Russian proxies violated the ceasefire twice. At midday, militants attacked the Ukrainian positions in Luhanske area with a grenade launcher and heavy machine guns. Near Malynove village in Stanytsia Luhanska area the enemy used an automatic grenade launcher and small arms. In Donetsk sector, Russia-backed militants attacked Ukrainian in Avdiivka area with small arms and under-barrel grenade launchers. Ukrainian troops did not return fire. Unfortunately, one Ukrainian serviceman was killed in action. Report on the military developments as of March 6 is available here. Interactive data on the shelling: chronology shelling chart and the interactive map.